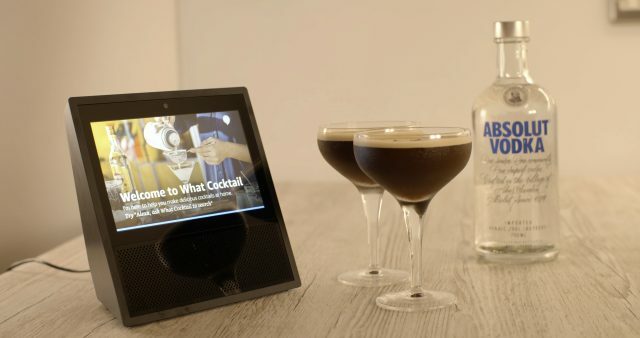 Pernod Ricard UK is the latest drinks producer to capitalise on the growing popularity of Amazon’s range of voice-activated digital assistants, launching a ‘skill’ on its new Show device that helps consumers make a cocktail based on the ingredients they have to hand. Designed in partnership with Amazon, ‘What Cocktail?’ is compatible with the e-commerce giant’s brand new Amazon Show device. The skill is voice-controlled, like existing Amazon Echo and Dot devices, but has been developed to make use of a screen that is unique to Amazon Show. The skill guides consumers on what cocktail to make based on what ingredients they have at home, as well as for specific occasions such as Christmas or Halloween, and will also suggest “hacks” to add flair. “Experimenting with smart technology is just one of the ways we are continuing our mission to shape the nation’s drinking experiences and we’re incredibly excited to be driving further innovation within the cocktail world,” said Sille Opstrup, head of digital for Pernod Ricard UK. The move is in line with Pernod’s ongoing strategy to position itself as the leader in ‘hometainment’, which began with the development of its OPN at-home connected cocktail library. The smart system, which mixes cocktails and is controlled through an app, was first unveiled in 2014 under the working title Project Gutenberg. OPN made its official debut at the CES technology trade show in Las Vegas this year, ahead of a planned commercial roll out in early 2018. OPN uses 75cl cartridges filled with varying spirits that are connected intelligently to track levels, measure and mix drinks via an app. It enables the user to learn and customise cocktail recipes, adapting them to available ingredients, drawing on a database of more than 300 cocktail recipes with step-by-step instructions. Furthermore, the system will devise a shopping list of ingredients for desired serves and order spirits to be delivered to you door on demand. Like OPN, the ‘What Cocktail?’ skill “champions home entertainment”, adds Opstrup, encouraging greater consumption of wine and spirits in the home. Pernod isn’t the first to buy into Amazon’s voice-activated technology. Last week Moët Hennessy confirmed that it too had partnered with Amazon to create a skill for its Amazon Alexa device. Called Bottles and Bubbles, the skill gives consumers the opportunity to learn about Champagne and to create their own experiences at home, instructing the app using voice commands such as, “Alexa, Tell me about food pairings” or “Give me hosting tips”. Pernod’s ‘What Cocktail?’ skill is available to download for free from the Alexa Skills store on www.amazon.co.uk, however users must have an Amazon Show.